E. Randol Schoenberg is of-counsel and was the co-founding partner of Burris, Schoenberg & Walden, LLP, where he handled a number of complex business litigation matters, specializing in cases involving looted art and the recovery of property stolen by the Nazi authorities during the Holocaust. Mr. Schoenberg has tried and argued cases before the United States Supreme Court, Second and Ninth Circuit Court of Appeals, United States District Court, California Court of Appeal and the Los Angeles Superior Court. During the past decade, he has litigated several prominent cases, including Republic of Austria v. Altmann case. 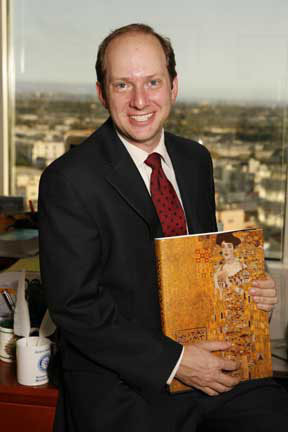 In the Altmann case, he sought return of six famous Klimt paintings to his client. After persuading the United States Supreme Court that Maria Altmann could sue Austria for return of the paintings, he agreed to arbitrate the dispute in Austria. In January 2006 the arbitration panel decided that the paintings, valued at over $325 million, should be returned to Mrs. Altmann. In 2007, Mr. Schoenberg received the California Lawyer Attorney of the Year award for outstanding achievement in the field of litigation. He also received the 2006 Jurisprudence Award from the Anti-Defamation League and the Justice Louis D. Brandeis Award from the American Jewish Congress. Cultural Studies. In 1991, he received his Juris Doctor degree from the University of Southern California. For news and articles concerning Mr. Schoenberg's cases, go to http://www.bslaw.net/news.html. All forms of civil litigation, including defense and prosecution of lawsuits, arbitrations and mediations. represent dentist in disputes with laboratory and former patient. represented author in dispute with publisher. Fried, Frank, Harris, Shriver & Jacobson, Associate May, 1997 to May, 2000. Complex business litigation: securities, class actions, antitrust, trademark and copyright litigation. handled action for breach of promissory note from inception through enforcement of judgment, including all aspects of discovery, summary judgment, post-judgment debtor's exam, two bankruptcy filings and an appeal to the California Court of Appeal, Second District. Katten Muchin & Zavis, Associate October, 1991 to April, 1997.
obtained a $300,000 ex parte writ of attachment and final judgment on behalf of a Chinese corporation for embezzled commission monies. Firmwide Professional Responsibility Committee and Executive Associates Committee. Wyman, Bautzer, Kuchel & Silbert, Summer Associate 1990. Researched and wrote memoranda on various litigation matters. L.A. County District Attorney's Office, Summer Law Clerk 1989. Major Fraud Division -- Allen Field, Head Deputy. Wrote memoranda on various subjects including usury and extradition, answered 1538.5 motions, observed trials, repaired computer network. L.A. County Supervisor Edmund D. Edelman Student Professional Worker, Summer 1986. Filed press releases, organized a file on the homeless and mentally ill, created an earthquake preparedness flier, drafted an article on drug-addicted babies, and recommended budget items. University of Southern California Law Center, J.D. 1991. Senior Thesis: "Two Music-Related Problems in Combinatorics"
Free University of Berlin, Semester Abroad 1987. Public Counsel 1995 Super Volunteer Award. Obtained temporary restraining order, preliminary injunction and restitution for indigent client who had been defrauded out of the deed to her home. Numerous newspaper articles and letters. Several articles on music-related topics, including "Arnold Schoenberg and Albert Einstein: Their Relationship and Views on Zionism" (Journal of the Arnold Schoenberg Institute. Volume X, Number 2, November 1987), reviewed by Robert Craft in The New York Review of Books (February 16, 1989). Wrote foreword for catalogue of an exhibit entitled "Exiles in Paradise" at the Hollywood Bowl Museum. Classical music, tennis, skiing, genealogy, art, basketball, law, mathematics, backpacking, philately, German, French, and computers. Member of Riviera Tennis Club, Los Angeles Opera (Board of Directors), Los Angeles Museum of the Holocaust (Board of Directors, President), Southwest Chamber Music Society (Board of Directors), Choral Society of Southern California (Board of Directors), AMSONG (Board of Directors), L.A. Jewish Symphony (Board of Directors), ASCAP, JewishGen Austria-Czech Special Interest Group Coordinator and Moderator, LACMA, MOCA, Music Guild.